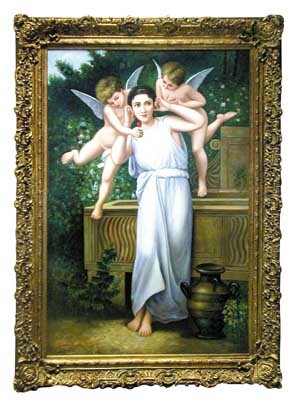 Spectacular oil on canvas reproduction of William-Adolphe Bouguereau's Youth (1893). This is one piece in a set of four commissioned by Antiquarian Traders and taking over two years to complete. These are high-quality copies of the works of the famous French painter. The tenderness and softness of Bouguereau's paintings were his hallmark. They feature and incredible attention to detail as well as a beautiful gilt wood frame. Unframed, the painting measures 71"H x 47.5"W.
Items Similar To "4464 Oil on Canvas Reproduction of Youth by William-Adolphe Bougu..."
4462 One of Set of Four Large Oil Paintings. 4465 One of Set of Four Large Oil Paintings on Canvas in Gilt Frames.